This second floor front bedroom offers a quiet and restful retreat. 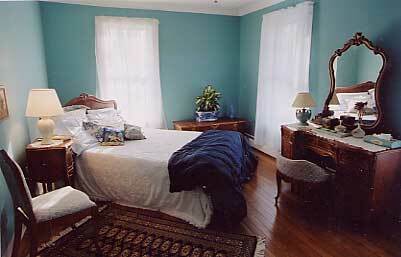 The Harbor Night offers a queen-size bed and is furnished with pieces from the original house. 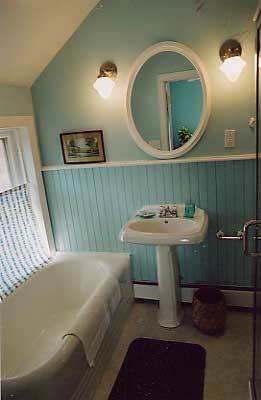 Its blue walls are accented with bright white trim. Your room features the original pressed tin ceiling and a private bath that could be featured in the best housing magazines. Your bath offers a glass enclosed shower area and a separate soaking tub so you can experience the elegance of a bygone era.